I am a girl with very tiny nails, literally small. If I chop them off they might look like nails of a three year old. But, I am a sucker for nail art and nail polishes. The way I decorate my nails, sometimes it leaves people bewildered and wondering how something like this can be done on small nails. Smalls nails or tiny nails also have scope of beautiful nail art, you just have to be open for creativity after all #shortnailsdontcare. Here are few fabulous nail art ideas for small nails. Polka dots can be as small as you need them, making them the perfect addition to a short nail mani. This is a tried and true trick for short nail manicures. Just pick a color palette and go wild! With short nails, a full floral mani would probably be too busy. This accent is the perfect balance, though. Look how adorable this is! Pink polish with an accent gem looks great on shorter nails! 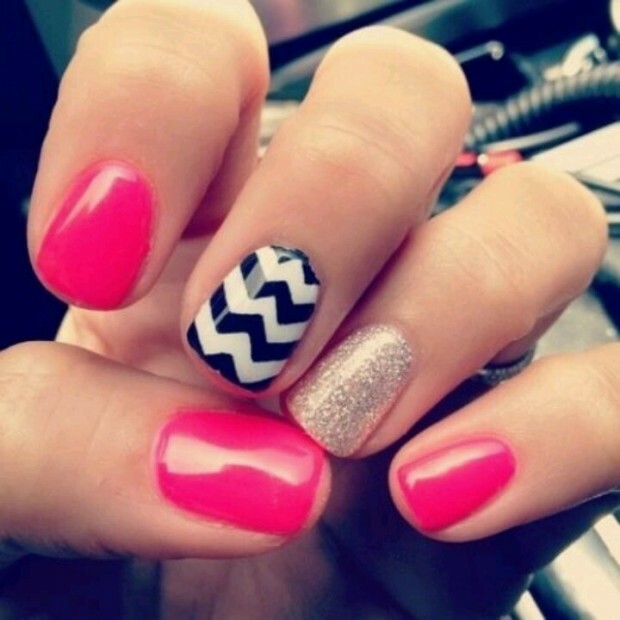 If pink nails are your thing, be sure to check out the next nail design on this list. Pink is the perfect base for a short nail manicure. Add a few sparkles and a little accent, like this black and gold bow, and you're all set. With short nails like this, one big blinging accent is more than enough. If you have to pick just one color for those short nails, why not make it hot pink? It's bright, bold, and totally beautiful. Confetti is an adorable design that pairs well with shorter nails. Paint the base black for the look you see below, or try painting them white for something with more of a pop. This is a fantastic look for shorter nails! A little gold accent on each with one bold ring finger nail design is the perfect balance. A few solid stripes work well with the shorter look, too! Yay! This design works to actually extend the look of your shorter nails. Luv luv luv!!! Thks for giving me some good ideas!! Stay posted and follow the blog Mel. More such ideas are coming ahead!